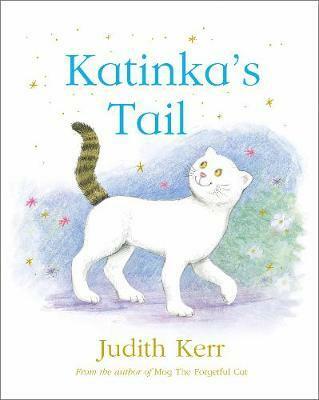 From the wonderful Judith Kerr comes another delightful tale about a very special tail! I’ve been a fan of Judith Kerr for many years and adore the antics of Mog in all her classic stories. Judith’s new lead feline, Katinka, is rather more cheeky and cheerful than Mog but equally as engaging. I am in absolute awe that Judith Kerr has written and illustrated this gorgeous book at the age of 94! She really is an absolute wonder. I love that Katinka’s Tail is written in first person. It draws you into the intimate relationship of an owner and her cat and we know that this story is based on Judith Kerr’s own cat. The imaginative and expressive illustrations show an elderly Judith, with her lovely cat. We see how Judith feels protective when people think Katinka is peculiar, her delight in seeing Katinka appear at the bedroom window every morning, and the everyday interactions that bring each other joy and draw them closer together. Katinka is just gorgeous. Her cheeky little facial expressions convey so much personality and playfulness and will guarantee children will fall in love with her. Judith Kerr really knows how to capture the character of a cat and show us the fun and delight a pet cat can bring. There is also an underlying message in the book that the thing that makes you different also makes you special. Katinka’s ‘peculiar’ tail is what makes her stand out and also what makes her so special.